When a renowned architecture scholar falls suddenly ill during a speaking tour, his son Jin (John Cho) finds himself stranded in Columbus, Indiana - a small Midwestern city celebrated for its many significant modernist buildings. Jin strikes up a friendship with Casey (Haley Lu Richardson), a young architecture enthusiast who works at the local library. As their intimacy develops, Jin and Casey explore both the town and their conflicted emotions: Jin's estranged relationship with his father, and Casey's reluctance to leave Columbus and her mother. Columbus is an absorbing, soulful and visually stunning exploration of meaning, separation and the weight of filial duty. 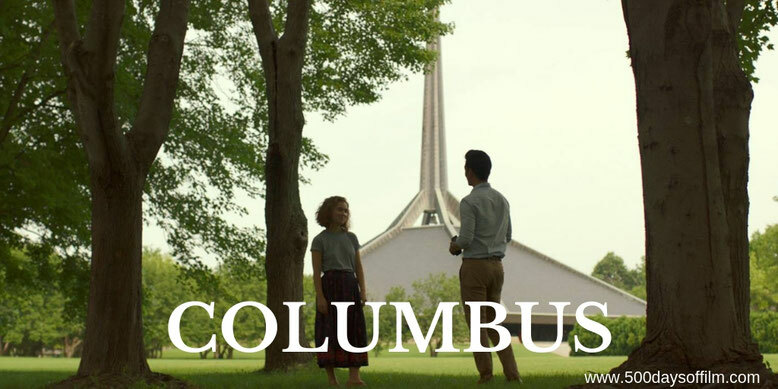 Set amid the mecca of modernist architecture that is Columbus, Indiana, Kogonada’s deeply thoughtful film is superbly portrayed by its two leads, John Cho as Jin and Haley Lu Richardson as Casey. In many ways, Casey and Jin are opposites that, in a largely platonic manner, attract. Jin has little time for architecture and wants to leave Columbus almost as soon as he arrives to visit his sick father. Meanwhile, Casey has a true passion for architecture - it is her means of escape. She desperately wants to stay in the city to care for her mother. However, as the film progresses, we understand the compelling reasons why Jin needs to be in Columbus and why Casey really should move away. The messy complexity of Jin and Casey’s lives is in stark contrast to Columbus’s ordered colours, interiors and locations. Everything is perfectly arranged, inspiring hope and introspection. It is clear that Kogonada and cinematographer, Elisha Christian, have taken exquisite care when framing every scene of this film. Almost every shot is an astonishing piece of art - almost overshadowing the human drama within. Christian’s often static camera observes Jin and Casey through door frames and reflections in glass and mirrors. However, the camera never feels intrusive. Each character is given space to breathe and process the meaning of their time in Columbus. The cumulative effect is both soothing and devastating. Columbus is a film that creeps up on you - largely thanks to Richardson and Cho’s rich and engaging performances (ably supported by Parker Posey, Michelle Forbes and Rory Culkin). As a result, before I even quite realised it, I found myself deeply invested in Jin and Casey’s story. It would take a hard heart not to be affected by Columbus’s moving conclusion. If you have, what did you think of this film? Let me know in the comments section below or over on Twitter. You can find me @500DaysOfFilm.